I was studying up on some pretty archaic methods for testing intelligence and I came across one called The Wheel of Judas. It is said that if you were able to fully solve the wheel that you were a danger to the kingdom and were sentenced to a lifetime of servitude outside of the capital (pretty brutal punishment for being smart). It was pretty confusing at first, but over time I managed to solve it; I am wondering if the community can do the same? The wheel can seem a bit overwhelming at first; I heavily recommend you take your time when studying it. The way it works is quite complicated so I will break it down. Outer-Numbers: These rotate in order (see below). Inner-Numbers: Simply swap with each rotation. Vowels and Word Plates: These pieces of the wheel are stationary and do not move. Mathematical Containers: These rotate through the order of operations (see below). The letter $a$ must always be used. One additional vowel may be used (only one per word). The additional vowel can come before or after the $a$. 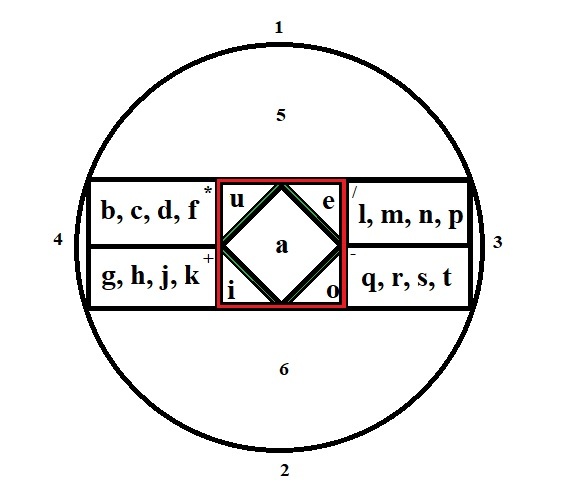 You can choose a number for all six words; however, once all six words have been found and the outer and inner numbers begin to rotate, the words remain at those chosen locations on the wheel. Each word uses the letter $A$. Each word must be at least three letters. Each word has at least one consonant. Each consonant remains on it's side of the vowel when created. Each consonant follows the order of operations in it's placement. The first letter of $a$ is equal to the last letter of $b$. $+50$ reputation bonus to someone who solves with a unique linking of numbers, that isn't $1,2,3,4,5,6$ or $6,5,4,3,2,1$. Note: The words given in this example will not count in a correct answer, no matter their placement. The vowel $A$ is used. The consonant $C$ (a multiplication) comes before $H$ (an addition) and both come before the vowel. The consonant $N$ (a division) comes before $T$ (a subtraction) and both come after the vowel. The wheel has been rotated. Only one extra vowel ($U$) was added. The consonant $G$ (an addition) comes before the vowel. The consonant $C$ (a multiplication) comes after the vowel and is the first letter in CHANT. Since there are many possibly combinations due to there being thousands of words available to choose from, the first technically correct answer will win. If the answer happens to be the answer I also arrived at, then I will award a $+50$ reputation bounty when I am able. What are six words that meet all given criteria for all four rotations? If you have anything you need clarification on, please let me know so that I can clear it up prior to your attempts at an answer. I tried to be as thorough as possible, but this can seem confusing and quite a daunting puzzle in my opinion. The mathematical containers are rotated during the word search process; once per word with the first rotation occurring after the discovery of word one. The mathematical containers were drawn in left to right, top to bottom order on purpose. The rotation of the containers is described correctly above. Don’t think of it as MDAS then SMDA, it rotates the available operations in the way depicted. Maybe someone better at phrasing can assist with the representation here? Each word is assigned to a plate below a number, the numbers are paired together; for example $1$ and $2$, $2$ and $6$, The full pairing example is supplied above. In the example given chant is at position $1$ and guac at position $2$; this means that position $6$ must end with $G$ somehow. When building your word, order of operations is considered on each side of the vowel separately. Read the example above carefully. A simple approach (but difficult to accomplish) is to find words that jump back and forth. With that pairing if you have three sets of words that start and end with the same letters it will work after the rotations because the rotation change what two words are compared. First word I chose before the word plates rotate is bait, placed in spot 1 (before numbers rotate), after first word rotation tab is made and placed in spot two, next rotation make tac in spot 3, then coat in spot 4, then dear in spot 5, then rad in spot 6. Bit of a cop out with this pairing. Still looking for a more complex pairing solution. Not the answer you're looking for? Browse other questions tagged riddle word knowledge story no-computers or ask your own question.